Who me? Late? I don’t know WHAT you’re on about. We ate this on time…. This month the BBBabes are relaxing and have decided to take it easy. We’re making Stromboli to celebrate the start of picnic season. Of course, me being me, I started thinking about actually baking it on Sunday…. My excuse is that it’s not quite picnic season here yet. It almost is. But not quite. Even though it should be by the middle of May. Our forsythia is still in bloom but starting to look less dazzling because it is leafing as well. The miniature apple(??) tree has just sent out its beautiful deep red blossoms. But it’s only going up to about 14C today and yesterday (BBBBaking day), it only went up to 10C. With rain on and off all day yesterday and most of today. Hmmm… I guess that nixes baking in the barbecue. Stromboli was named after the volcanic island located off the coast of Sicily by the same name? So named because of the way the cheese and fillings erupt from the holes pierced in the rolled Focaccia dough, that you pierce before baking. 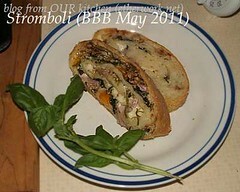 -Heather, girlichef.com, Stromboli… bread stuffed and erupting with deliciousness! Stromboli is a type of turnover filled with various cheeses, Italian meats or vegetables. The dough is Italian bread dough. Stromboli is reported to have originated in 1950 in Essington, Tinicum Township just outside of Philadelphia, at Romano’s Italian Restaurant & Pizzeria, by Nazzareno Romano. While there are many different types of meat turnovers the world over, none are quite like the stromboli, somewhat similar to the submarine sandwich and close relative to the calzone. […] Most people credit Nazzareno Romano, the proprietor of Romano’s Italian Restaurant and Pizzeria, in Philadelphia, with its invention. […] The name for stromboli is a direct reference to the neorealistic film by director Roberto Rossellini, Stromboli terra di Dio, […] made in 1950, and the sandwich/pastry by the same name is said to have emerged at roughly the same time as the film’s release. Aha!! So THAT’S why I can’t find any stromboli recipes in our Italian cookbooks! The recipe that Heather used suggests filling the bread with smoked swiss cheese, garlic, prosciutto, pepperoni and fresh basil & rosemary. Which looks and sound delicious, of course. I was a little surprised that Saveur magazine didn’t have a recipe for stromboli. But they DO have one for calzone, filling it with: mozzarella, anchovy filets, san marzano tomatoes, oregano leaves. As good as that sounds, I nixed it. None of the stromboli recipes I looked at call for tomatoes (except the vegetarian one at livestrong.com). 16 May 7:00 am: Oh oh… Today is posting day and I’m just now thinking about getting the flour out and what fillings we’re going to have to get at the store today. 8:20 am T just asked me if the amount of flour is the same as we would do for a pizza. Huh?? This is coming from the guy who never measures anything. And why does the amount of flour matter? T: Don’t make too much. I don’t want it to be too bready. Being the obedient and dutiful person I am, I looked and see that Pat calls for 3.5 cups of flour and I usually use 2.5 cups of flour when we make pizza. Using the handy calculator at gourmetsleuth.com, I converted various ingredients into grams so I could work out the percentages. Fascinating. The only real difference between our recipes is the amount of oil. So. Instead of using 1 Tbsp of olive oil that I would normally put into that amount of flour, I’ll add 2 Tbsp. The dough was easy to mix. And nothing bad or untoward has happened yet. 3:20 pm The pepper is ready to go. (I found a jalapeno pepper in the fridge and roasted that as well as a small yellow pepper.) The spinach is salted. T made BRILLIANT Italian-style sausage. We get terrific ground meat from our butcher. He always grinds it fresh and there are never any sinewy bits in it. We also got wonderful ham – smoked by the same excellent butcher. And I wheedled enough at the deli counter to get T to agree to us buying a small amount of Provolone to go with the mozzarella. There’s a bottle of San Giovese on the counter waiting to be opened. We also got hold of a copy of Rossellini’s “Stromboli, terra di Dio” and tonight are going to eat Stromboli while watching Stromboli. Hey!!! WHERE’S the mozzarella?! I looked in our bikes, in the freezer, in the vegetable drawer. No mozzarella. Luckily, there was a new block of Monterey Jack in the fridge. We’ll use that. 7:15 pm Once we got over the cheese problem, assembly is dead easy to do. Into the oven it goes. It looks great already. Is it time to eat yet?! 7:30 pm I love the sound of the Stromboli popping in the oven as steam pushes bits of oil out of the holes. 8:00 pm It’s done!! Waiting for 10 minutes as it rests is killing us. It smells wonderful. The holes that are pierced into the shaped bread just before baking are to encourage lava-like eruptions. This particular stromboli was rather quiet… allowing only a little lava to escape. dough: Pour lukewarm water into a largish bowl; add yeast and whisk well til the yeast is dissolved. kneading: Scatter a dusting of flour onto the counter and plop the dough down. Knead the dough by hand for 5 to 10 minutes until the dough is smooth and elastic. Refrain from adding extra flour; use a dough scraper to keep the board clean. proofing: Put dough in the clean dry bowl (it should be large enough for the dough to double – there is no need to oil the bowl). Cover bowl with a plate and allow to rise on the countertop until double (a couple of hours – depending on how warm your kitchen is). filling: Wash the spinach well – include decent looking stems too. Put the washed spinach in a colander and sprinkle it well with salt. The salt will cook the spinach. I’m guessing that I use around a tablespoon of salt for a big bunch of spinach leaves. Toss the leaves to spread the salt around and then allow the spinach to rest and drain for about 30 minutes – more or less. When you return to the spinach, you’ll see that it’s quite limp. Squeeze it out. Hard. Rinse, taste for salt and squeeze again. Hard. You’ll be left with the most wonderful emerald green spinach balls. Chop these coarsely to put on the pizza as you assemble it. The green stays wonderfully green and the spinach taste is lovely and fresh. Salted spinach keeps well in the fridge for about a week. Core and seed the pepper. Place it skin-side up in a 400F oven for about 20 minutes til the skin is dark coloured all over. Don’t worry if some of it gets black. Remove from oven and cover with a paper towel and let sit for about ten minutes. Peel the pepper, composting the skin, which should easily pull away. Julienne the pepper for the filling. assembly: Lightly flour the counter. Stretch the dough out into a rectangle. Spread the filling ingredients evenly overtop. Roll up like a jelly roll, rolling on the loose rather than tight side. Place the roll on a parchment covered jellyroll pan (cookie sheet with sides). topping: Use a skewer to pierce the roll through to the parchment paper. Scatter/drizzle topping ingredients over top. Bake for about 40-50 minutes until dark golden brown, turning the bread around half way through the cooking to account for uneven oven heat. Don’t worry about any eruptions. When the stromboli is (are??) done, remove to cool for about 10 minutes onto a footed rack before slicing. And then slice and dig in!! 1.) Water: Tap water is fine to use – just make sure that it has stood for at least 12 hours so that the chlorine has dissipated. Under no circumstances should you use water from the hot water tap. Heat the water in a kettle or microwave and add cold water until it is the correct temperature, (use the baby bottle test on the back of your wrist – your fingers have no idea of temperature!) Dan Lepard suggests using a ratio of 1 part boiling water and 2 parts cold water. Or you can use a thermometer. Note that the water temperature must be BELOW 48C (120F) because yeast begins to die when the temperature is higher than 48 C. 2.) Flours: The BBB recipe calls for unbleached all purpose flour only. I am incapable of making bread with just white flour and always like to add just a little whole wheat flour – to mimic rustic milling (thanks to Carol Field for this idea that is laid out in her wonderful book “The Italian Baker”). 4.) Hot Italian Sausage: Of course we can easily buy hot Italian sausage, but T decided to make sausage himself by mixing ground pork with coarsely ground fennel seed, garlic and crushed dried chilies (the kind used for Indian cooking – I think they’re cayenne peppers). I was expecting stromboli (the bread) to be good and Stromboli (the movie) to be rather forgettable. I was wrong about one of those. Stromboli (the bread) is fabulous. Imagine how great it will be when it’s cooked on the barbecue! There are entirely too many bread books and blogs with bread recipes…or not enough. One of my favorites is Carol Field’s The Italian Baker. I was thinking of having the Babes bake her very complicated Panettone con Dotteri e Noci, a recipe that has intrigued me for a while. Once I realized that it is a laminated dough and that April and May can be too hot for laminated dough, I looked elsewhere for May’s bread. I’m inviting ya’ll to gather round the kitchen table in May of the Bread Baking Babes 4th year and bake Stromboli. […] It’s getting to be picnic time, or will be by the time this bread gets posted, so I hope you’ll enjoy it. We did! We did!! Thank you, Pat and Heather! Of course, you’ll want to bake along and receive a Baking Buddy Badge to display on your site; bake Stromboli and post about it before the 29 May 2011. Katie, Thyme for Cooking: Bread Baking Babes join me in Italy… Stromboli! Natashya, Living In The Kitchen With Puppies: The Bread Baking Babes make Stromboli! Tanna, My Kitchen in Half Cups: Gorn begs for this one! This entry was posted in baking, BBBabes, bread - yeasted & unyeasted, bread recipe, food & drink, posts with recipes, PPN; YeastSpotting, MLLA, Bookmarks; T&C, spicy on Tuesday, 17 May 2011 by ejm. That looks like a perfect vulcanic eruption to me! Lovely how your slice is superfilled with stuffing! Again a reminder that I need to stuff more. Bread not my face. Although that may happen when I see your slices. Looks yummy! A stromboli on the plate is worth two on the screen. I loved this bread; the movie…? Not so much. Great looking stromboli! Or strombolo – I wondered the same thing. Glad T loved it too. Filling to bread ratio was important to my dudes too – my son wants it extra bready and my husband likes it thin. I made three, all my bases were covered. Absolutely have to make this one again. Love that quote by Ingrid Bergman. Looks great! Now I want to watch the movie, out of curiosity. Maybe the Babes could write to Steven Spielberg and remind him that collectively we speak English, French, Swedish, Italian, Spanish (and others?) and we are ready to come make a film with him, or bake him some bread. Yes, we were very pleased with the almost (but not quite) overstuffed lava-like insides, Lien, Karen and Elle. Thank you Natashya. You made three!!! How brilliant are you? Yes, Tanna, you must (we did last night and it was as brilliant as the first time). It was, Barbara; it was! Wow, those slices look divine! I’ll definitely have to try some toasted slices with soup, that sounds great. I loved your post and take on this recipe. Here in Sweden picnic season has just started, and this stromboli is already on our favourites.